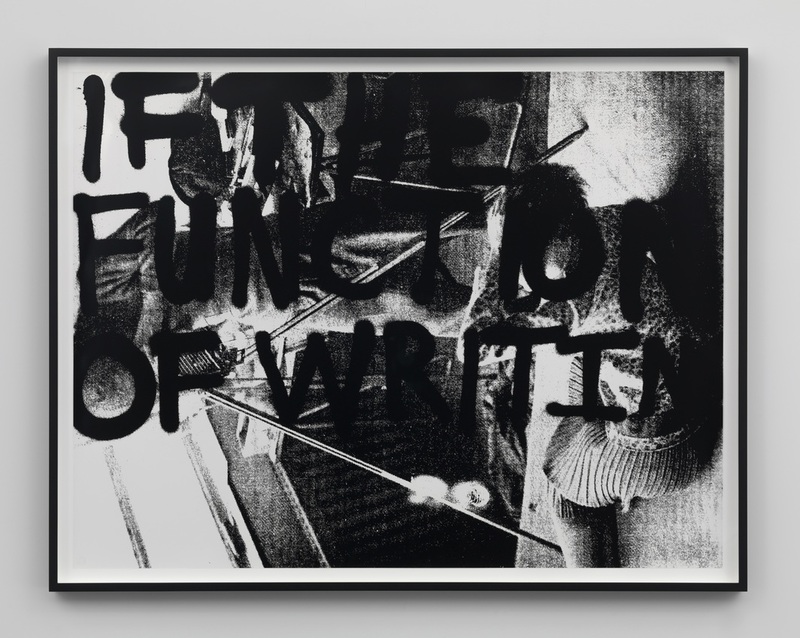 Adam Pendleton, if the function of writing, 2016, silk-screen ink on Mylar, 29 × 38". As seen in one of Pendleton’s various floor-to-ceiling wall works, a reproduction of a historical installation of paintings by Holocaust escapee Marc Chagall appears to be disintegrating or reforming, as are elsewhere a towering knife and hatchet. In a central grouping of pieces, four tall shadowy paintings hang on top of a separate text-based wall work. The paintings, Untitled (A Victim of American Democracy), 2017, and the text work, A Victim of American Democracy IV (wall work), 2016, contain letters but refuse any standard formation of them into words. So too for a new lobby installation, A Victim of American Democracy II (wall work), 2015. What looks like a partial D next to an E might be the start of the word democracy, but as they are here, enlarged and printed from a collage of letter fragments, they are typographically and linguistically obstructed, cut off from other jaunty, orphaned, and inchoate neighbors. For what is… (study), 2017, Pendleton wrote and repeated the phrase “What is Black Lives Matter” across and down a piece of Mylar, bounding off the page at the end of each line, filling it up, then turning it ninety degrees to continue on. Where different letters overlap, they negate each other and allow for new forms, nonsense quasi-words such as –ciives, *kue_, and bluac. If this is language, it is a dissonant one—a radical cacophony, more of which could maybe knock against disgusting truths.